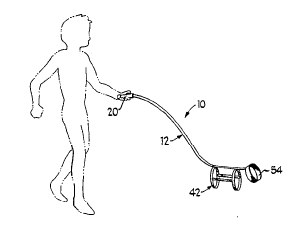 A novelty item for creating the illusion of an imaginary pet including a hollow, elongated leash with a handle at one end and a collar and harness adjacent the other end. Housed within the handle, which is hollow, is a battery power source and an integrated circuit for producing a plurality of animal sounds. Also carried by the handle are an on/off switch and at least one selector switch for the sound circuitry. Mounted within the collar end of the leash is a micro speaker which is connected by wiring through the hollow leash to the circuitry in the handle.